Dear Readers , Baba said that He was omnipresent, occupying land, air, country, world, light and heaven, and that He was not limited. Many,many time Baba has directly -indirectly indicated HIS devotee how in many ROOP he comes and help them at the time of crisis.In the following incident it is something like this . 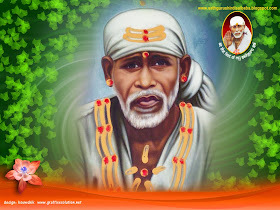 T.G Samanth went to Shirdi. in 1915. He had only Rs.5/- with him, out of which he gave Rs.1/- as Dakshina to Baba. Baba demanded one more rupee, which Samanth was reluctant to give. None-the-less Baba kept on asking for it, till finally Samanth parted with it. Baba took the Rs.2/- and turning them upside down said "You have given these Rs.2/- to the one letter God (Ganapathi).Now you may go. Ganu Mahar will bless you". Samanth was in a hurry to leave, and rather upset at parting with the other rupee, that he didn't understand what Baba said. By His blessing Baba wanted to remind Samanth, that He had appeared to him, earlier as Ganu Mahar. 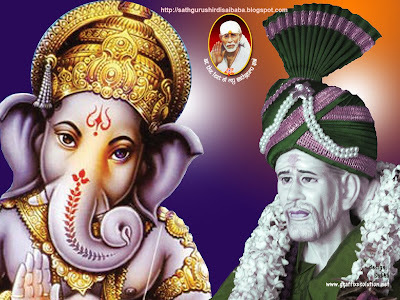 Samanth was then 21 years old and Baba as Ganu Mahar had initiated him with the mono syllabled mantra of Lord Ganapathi. Then Samanth had performed one crore of Japa of the same. On reaching Kopergaon the Gujarati paid both their fares, further, he bought two tickets to Dadar, Bombay. They had a comfortable journey, and alighted at Dadar. The Gujarati gave Samanth a hearty meal. Samanth was puzzled at his kindness. He asked the Gujarati's name and address 'Ganu Marwadi, Plot No1, behind Masjid Bunder'. He said and left. The next day Samanth went to meet his benefactor and return the money. He searched invain, as no Ganu Marwadi lived there.The whole area was inhabited by Muslims. Samanth then thought about Baba's words seriously. He recollected how he had lost his way in the forest near Triambakeshwar earlier. At that time some robbers have taken him captive to a cave and threatened to kill him. He had fervently prayed to Ganapathi for protection. When a loud voice called out "Jai Malhari" this frightened the robbers and they set him free. On another occasion he missed his way in the same forest, again he had prayed to Ganapathi. Suddenly a man affected with black leprosy stood before him and said "My name is Ganu Mahar. You have missed your way. I will show the way, but, you must not turn back and see. Agreed". Samanth had agreed and they proceeded. Ganu Mahar was behind him directing him and conversing with him. When they reached the main road Ganu Mahar was silent. Samanth turned around and there was no one. Thinking over it calmly he realized that he who had freed him from the clutches of the robbers, Ganu Mahar who had showed him the way in the forest, and Ganu Marwadi the kind Gujarati gentleman were forms assumed by Baba. 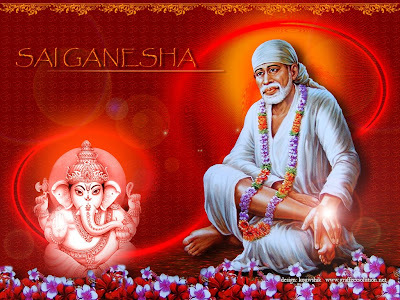 Thereafter Samanth began worshipping Baba in the form of Ganapathi. How beautifully Baba realizes HIS devotee, that HE is vigilant and looking after each and every single person .No matter we remember HIM or not ,no matter what the situation or circumstance be...if HE has decided to take care of HIS child HE will go to any extent .HE is running before time and saving and helping HIS children ,there are so many leela and stories proving this. Who else can be so gracious and so actively alert for HIS children none other than OUR BABA SAI.At holy feet of my Sathguru Sai shall I always remain.Jai Sai Ram .